Mundane days appeal to me sometimes. Those days that just rock along at a comfortable pace without dragging or spinning into chaos—they are the ones responsible for helping smooth my numerous rough edges. Yesterday was one such day, though I didn’t know it until the day was almost over. I started the day with my usual coffee and reading online news, then rewriting an absurd fantasy piece that I’ll probably bury once and for all before long. I puttered around the house, waiting for a technician to perform seasonal maintenance on our HVAC system, while my wife drove to Little Rock for a day of errands and shopping. I swept the garage of leaves and blades of grass that hitchhike in on car tires. I vacuumed the dust and flour and salt and such that accumulated on kitchen floor since only the day before. Lunch comprised a tuna sandwich and finished the remaining scraps of Manchego cheese. I mourned the Manchego’s disappearance, but began planning how and when I would replenish the supply. I washed dishes, fiddled with window blinds that needed adjustment, and otherwise occupied myself with minutia that did not require much energy, attention, or skill. When my wife returned home toward 4 p.m., I suggested we go to the new(ish) pub & grill a few miles away. She agreed (only out of pity, I think, hoping it might boost my somewhat sluggish sense of joy that I was alive. It turned out that a visit to the pub (the Beehive Gastropub) was just what both of us needed. I had a Core Brewing Arkansas Red Ale and Janine had a spicy margarita. My beer was tasty, but her margarita was out of this world good! And we shared a plate of pork piccata bites; tiny plate, but nicely presented and quite good—and inexpensive! The place serves appetizer-sized plates, something I truly appreciate. After that diversion, we dropped by her sister’s house to pick up a package Janine had asked her sister to order (After Eight mints, one of Janine’s guilty pleasures), using Amazon Prime (we don’t have it). Carol invited us in for a drink, so we sat on her deck, lazily sunning ourselves and chatted for a bit. During the conversation, the talk turned to a new(ish) pizza place in downtown Hot Springs. We decided to give it a try. We headed to town and made our way to Grateful Head Pizza Oven and Beer Garden. The place is in a multi-level, very old, building that has been outfitted with several multi-level decks (using reclaimed lumber, it seems). Neat looking place. It took quite a while to get someone to seat us (the sign told us to wait). Once seated, we waited and waited and waited and waited. Finally, I went to the cashier’s area and, after being ignored for a while, finally caught someone’s attention. I asked, “May we expect that a server might eventually make his or way over?” Yes, of course, many apologies. From that point on, things picked up dramatically. Good service, extremely good pizza, and a decent beer from, of all places, Nebraska. 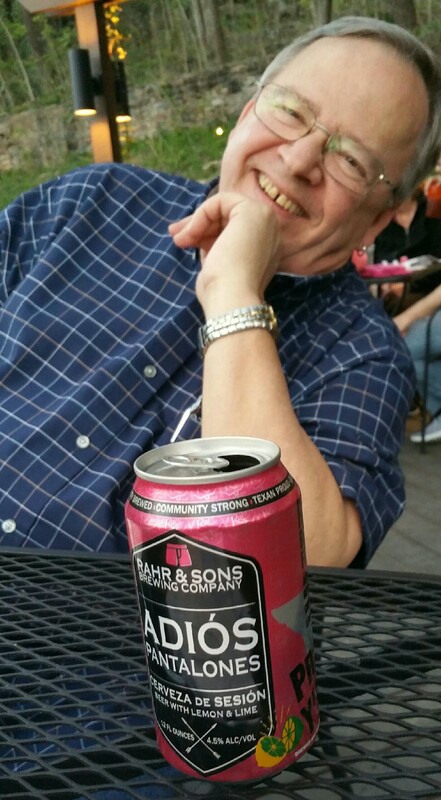 I’d had too much beer by that time, but that didn’t stop me from ordering another one, a beer from Rahr Brewing in Fort Worth, Texas. I’d liked the other Rahr brews I’d tried and the name of one on the menu appealed to me: Adiós Pantalones. As disappointing as it was (I left most of it), the evening capped off a rather nice day. A rather dull, lazy day turned into a relaxed, kick-back-and-enjoy afternoon and evening. My wife drove home, a good thing given that I’d had about four beers during the course of our impromptu multi-venue shindig. We ordered far too much pizza for the three of us to consume, so we left with two boxes of pizza. It should last two days, but I’m afraid I will cut that down to a matter of hours. My sister-in-law took the photo, which captures my mood about as well as any photo could.